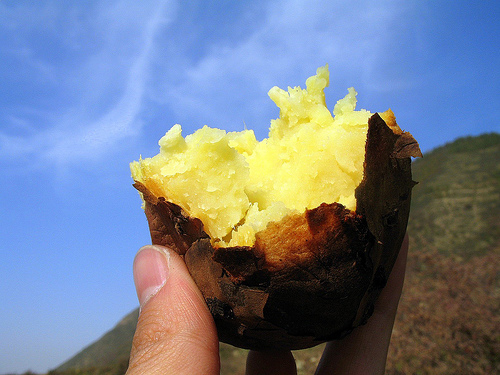 During the fall harvest in Fujian, China, sweet potatoes slices, basking in the noonday sun, blanket entire hillsides. The desiccated roots can then be kept throughout the winter, when the mother of a peasant family, searching through the pantry, might find only a few cups of rice remaining at the bottom of the sack. She reaches for the strips of dried sweet potatoes, carefully rations them for a long winter, and drops them tenderly into a pot of boiling water. My own mother will sometimes steam a sweet potato. She reaches into the pot, retrieves the unassuming root, and peels back its reddish-brown skin to reveal an orange flesh that is sweet, moist, and powdery. Ipomoea batatas is hypothesized to have its origins in Mexico’s Yucatan Peninsula. From there, vine cuttings spread the plant, in time, to China. In 1594, Fujian’s governor Chin Hsueh tseng, spotting impending famine on the horizon, urged farmers to cover their fields with swatches of Ipomoea batatas‘ deeply lobed leaves. This canopy of nature’s sublime solar panels widely stretch out their green arms in an affectionate embrace of the sun’s life-giving energy. They dip into an incomprehensibly continuous river of joules hurled through 93 million miles from an infernal astral furnace at nearly 300 million meters per second. Dancing down to Earth, these ethereal photons are gathered by chlorophyll molecules that shake and vibrate on collision. A distant relative of the potato, this herbaceous perennial vine easily thrives under abundant sunshine and warm nights, and its tuberous, red roots rapidly become botanical organs gorged with a rich supply of protein, carbohydrates, iron, calcium, and beta-carotene. Perhaps Chin saved the “old hundred surnames” from starvation by supplying each of them with little red bags filled with the currency of life, jewels captured by Mother Earth from the solar gods. 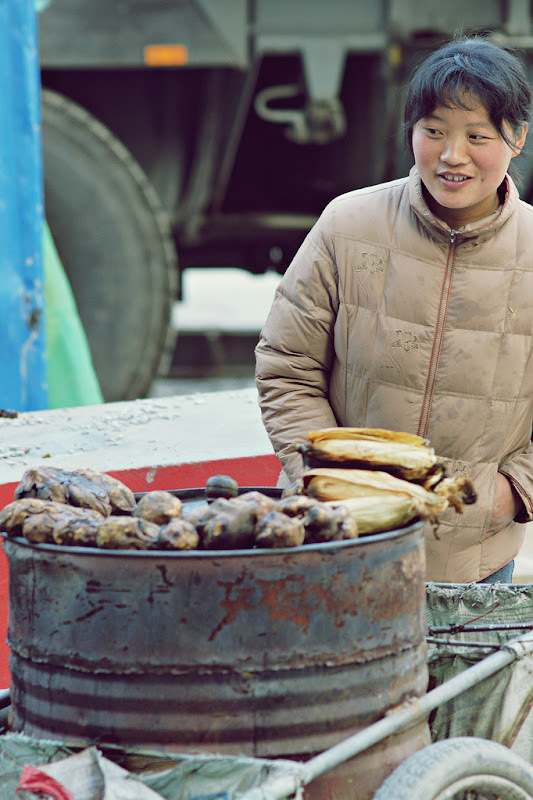 A sweet potato street vendor in China. In his childhood, my father remembers gathering this currency on mountains, curing strips of sweet potatoes in the sun, waiting for their wound tissues to regenerate with a new peridermal layer. But in the Middle Kingdom, sweet potato was considered marginal food, pig-feed in well-off families, food of the poor, and the bottom of the staples hierarchy climbing from sweet potato to millet to wheat. In the late 1960s, at the behest of the never setting Red Sun, my Chinese teacher was sent up to the mountains and down to the villages to learn correct political thought from the peasants. I didn’t want to stay in school. Toiling in the fields, chopping firewood in the mountains, and eating bitterness mixed with sweet potatoes, he wasn’t allowed in school even if he wanted to go back. When China reformed and opened up in 1978, he descended from the mountains and rose from the villages with a different wish: I realized I wanted to stay in school. That was the best time of my life. I guess that’s why I became a professor – so I could stay on campus forever. Today, the sight of sweet potatoes makes his stomach churn.